Ingredients (For 2) Prep & Cooking Time: 10 minutes. -Prep all your ingredients - peel onion, garlic and slice them up roughly. Slice a chunk of fillet of beef (usually what you get for one person). Wash the sugar snaps. -Heat the pan (I usually have this on whilst I am prepping) get the pan very hot. 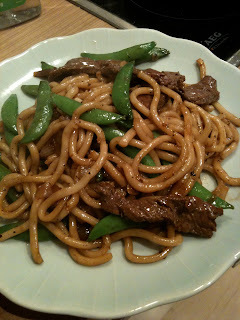 -Then fry the udon noodles with a few splashes of terriyaki sauce and marinade (about 2 tbs each). 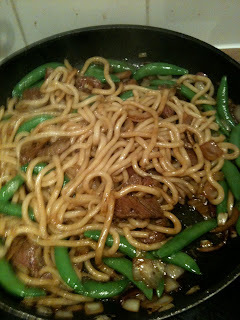 The hot pan should give the noodles a lovely golden colour. After a couple of minutes, take the noodles off the heat and leave to one side in a separate bowl. 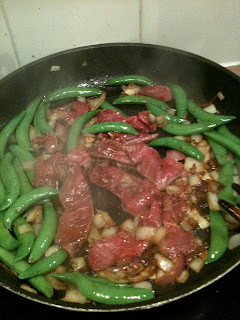 -Put the frying pan back onto the heat - get it nice and hot again, in with the onions, garlic and sugar snap peas. After a minute, throw in the beef and fry with terriyaki sauce and marinade. Brown both sides of the meat then add back to the pan the noodles. -Now is the time to taste it all, season with pepper and a few pinches of brown sugar. -Combine all the ingredients well. Serve.